Home > Animal Free Children > What is Tofu and How Can I Use It? Say the word ‘tofu’ to most people and the reaction you’ll get is either a screwed up face relaying some level of misapprehension, a screwed up face relaying distaste, or a blank face. There is still a lot of stigma surrounding tofu and it’s uses in cooking. Tofu is seen as the ultimate representation of vegetarianism and veganism – the misconception being that it’s a bland, second-rate meat and fish substitute. Whilst tofu does add extra texture to many meals, and has little flavour and smell of it’s own, when prepared, seasoned or marinated properly it can add a new dimension to a vegetarian or vegan meal. Tofu’s most literal translation is ‘bean curd’, made from the coagulated and pressed curds of soy milk. The coagulant (curdling) agent can vary during manufacture, which in turn can affect the nutritional content – for instance the calcium or magnesium content may vary. Tofu may prove popular with vegetarians and non-vegetarians alike because of its virtually non-existent saturated fat, iron and isoflavone levels. Bean curd also features heavily in Chinese and Japanese cuisine and is a fantastic source of ‘complete’ protein. There are actually different types of tofu; most notably silken (soft) tofu and firm (normal) tofu. If using tofu in a recipe, you’ll usually be instructed which type of tofu is best to use. Normal (firm) tofu, or bean curd, comes in a range of consistencies – soft, medium, firm and extra-firm. Because firm tofu tends to hold its shape, it tends to be used in Chinese-style cuisine, such as stir-fries. It also requires refrigeration, so compared to silken tofu has a relatively short ‘shelf life’. Silken tofu is more delicate and crumbly in texture, and doesn’t really require refrigerating. Silken or soft tofu is also more readily associated with Japanese-style cuisine. 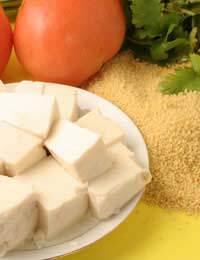 Like firm tofu, silken tofu can be found in different consistencies, ranging from soft to extra firm. It’s fair to say that tofu itself doesn’t really have any taste of its own. Because of this, tofu unsurprisingly often has a bit of a reputation for being bland. Rather, tofu takes on the taste that you want it to take on. It soaks up flavours and aromatic spices with ease. Simply leave the tofu mixed with any marinade for an hour or so, before cooking. Once the tofu is suitably marinated, it can be cooked and added to a source to provide texture to the dish. The amount of cooking that Tofu needs is open to debate and opinions do vary. Some sources say that tofu can essentially be eaten raw. But many people prefer to steam the tofu for a minimum of 15-20 minutes to kill off any potential bacteria. Another method is to slice the tofu into strips and gently fry off. Tofu is a fantastically versatile food – whatever you have planned, the chances are that you can incorporate tofu into the meal as your meat-free alternative. Try baking, cooking or sautéing and see for yourself!